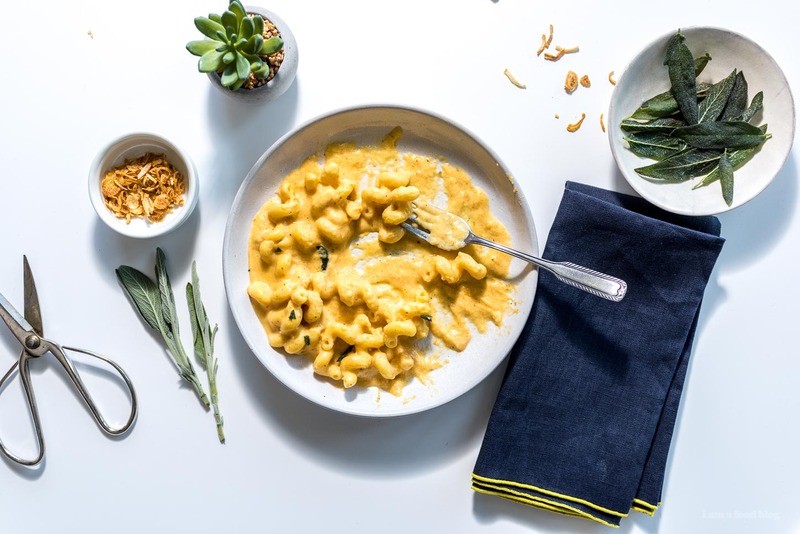 Easy dreamy creamy one pot stovetop pumpkin mac and cheese, no pasta draining necessary. Get your autumn on! 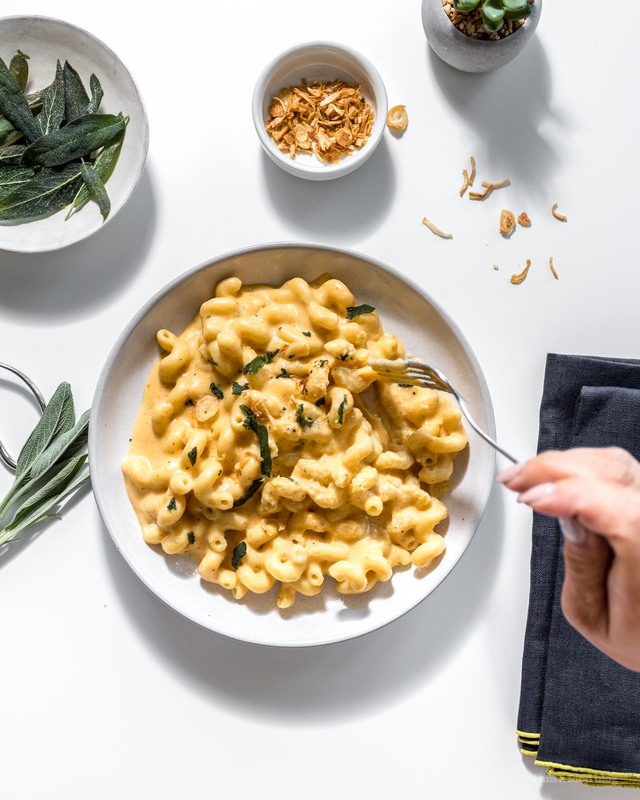 One pot pumpkin mac and cheese is my new fall favorite meal and maybe it will be yours too. 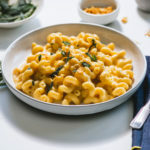 As much as I love baked mac and cheese (or even waffled mac and cheese) there’s something about a one pot, stovetop recipe that gets me every time. This one is the one guys, it’s the mac and cheese you’ve been looking for! It’s been raining buckets outside – rainfall warning style – and Mike and I have been holed up at home, unwilling to venture out into the wind and rain. Although I claim that I’m a homebody, loud and proud, I don’t really remember the last time we spent the whole day at home. But, it happened! We spent the entire day in. It was super productive. I made a veggie lasagna, got a bunch of work that I needed to get done, and even had time to relax underneath our kotatsu. 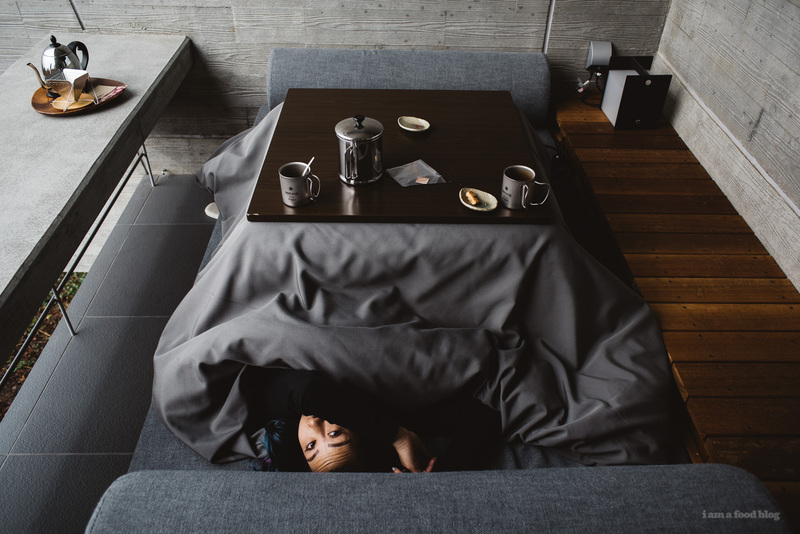 If you’ve never kotatsu-ed, I hope you get a chance to! Kotatsu is a magical Japanese invention: essentially it’s a low wooden table with a heating element underneath, covered by a thick blanket, then a tabletop. It’s so cozy, especially if you open up all the windows so you have mix of crisp outside air and cozy warmth. Sometimes we’ll eat dinner right at the kotatsu, and I must say, it is luxurious! But, you know what? There is a down side – I can’t even count how many times I’ve fallen asleep underneath it, only to wake up in a stupor, wondering where I am and how much time has past. Luckily, that didn’t happen last night, but it was probably only because I was looking forward to dinner, which was pumpkin mac and cheese leftovers. I have never made a one pot mac and cheese before this one but I think I’m hooked. 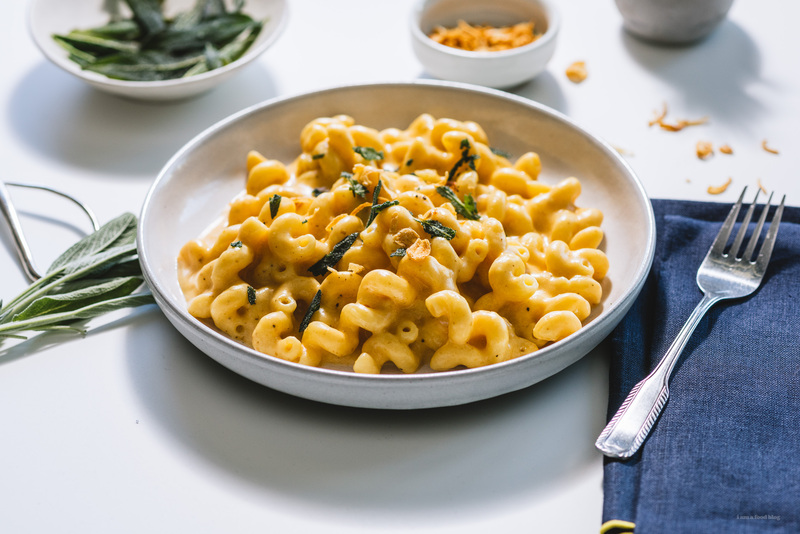 Draining pasta is never fun and this turned out so creamy and cheesy. It was delicious before I stirred in the pumpkin, but after it was even better, especially with a bit of freshly grated nutmeg. Call me basic, but come October, give me ALL the pumpkin things. The more pumpkin, the better. So, before you head out and make this, here are a couple of notes! This tastes equally delicious with or without pumpkin, so if you’re not into pumpkin, make it without, it’s an awesome recipe. I prefer weighing out the pasta, just because it’s more precise, since different pasta shapes measure out differently in cups. 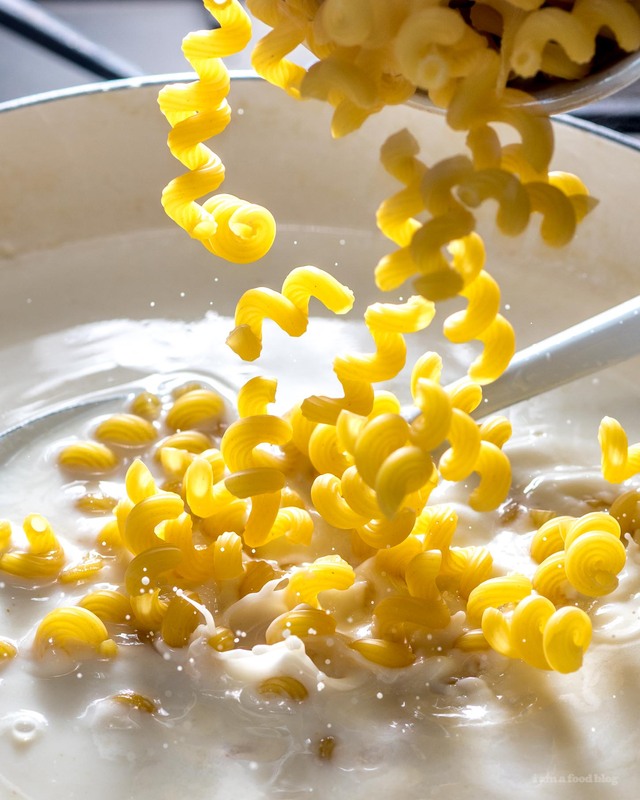 You may think that the one pot is just a gimmick, but cooking the pasta in milk makes it tender and you get the bonus of the starches mixing and emulsifying with the sauce, making it nice and silky. Also, right when your pasta is cooked, the sauce will look very thin. You’ll be adding in cheese, so don’t worry, it’ll thicken up – it’s always better to have too saucy pasta than too dry, in my books. In a large sauce pan, melt the butter over medium heat. Stir in the flour and cook, stirring, until smooth, 1-2 minutes. Pour in 1 cup of the milk in a thin stream while whisking – it will be quite thick. Whisk in the rest of the milk and 2 1/2 cups of water, mustard, garlic, and onion powder. Add in the nutmeg (if using). Add in the macaroni, stirring occasionally, until wisps of steam come up as you stir. Turn the heat down to medium low. Stir occasionally as the pasta bubbles away, gently, for about 9-10 minutes, or until the macaroni is tender and the sauce starts to thicken. It should be quite liquid/saucy at this point as adding in the cheese will thicken it up. Remove the pan from the heat and stir in the cheese and pumpkin quickly. Season with salt and pepper and let stand for a couple of minutes. The sauce will thicken as it rests. Enjoy! That picture of the macaroni falling into the milk is so cool! Which type of cheese did you use? Trying to think of what would go best with the pumpkin. Maybe a blend? You mentioned the mustard powder in the directions, but didn’t mention the onion, or garlic powder. Do we whisk those in at the same time that we add the mustard powder and the nutmeg? This sounds super good! Will doubling all the sauce ingredients for 1 pound of pasta work? i haven’t tried, but yes, i think that would work! This recipe is awesome! The pumpkin makes the texture amazing. Thanks for sharing! This recipe was awesome! I used penne pasta which takes a long time to cook (aka. extra creamy from cooking it down so much) but, it still turned out good. I’d definitely add 1tablespoon of salt, a bit more garlic powder, and a bit more pumpkin to give it an extra pop, though. Super easy, simple instructions, and my Dutch oven was perfect for the mac! Great comfort food recipe! so happy you liked it and made it your own emily! Just made it! This is definitely a great recipe! I added an additional 1/2 cup of pumpkin to mine to allow it to shine through the sharp cheddar I used.